Let’s get back to our visit to the Sistine Chapel with our eyes trained upwards. Today, I’d like to take you inside one of the most iconic scenes in religion and art: the original sin and the expulsion from the Garden of Eden. Countless artists have attempted to depict this scene, but, as you can imagine, Michelangelo gave it an interpretation all his own. We are more or less at the center of the Sistine Chapel; the composition is similar to that in the Creation of Eve that we’ve talked about; the dimension of the figures is enlarged to make them more visible from below. Just think: the figure of Eve is over two meters high! Michelangelo uses the same device as for the creation of the stars and the plants, dividing one field in two to optimize the space. The dividing element here is the Tree of Knowledge of Good and Evil, full of symbolic power. Michelangelo started painting this scene from the left with the large fig leaves of the tree. Below it, Adam and Eve are depicted for the first time. With a rather stiff, awkward gesture, Adam stretches to reach the fruit (it was probably a fig, not an apple like we always thought! ); beautiful Eve is in a languid pose, stretching her left arm towards the temptress snake. 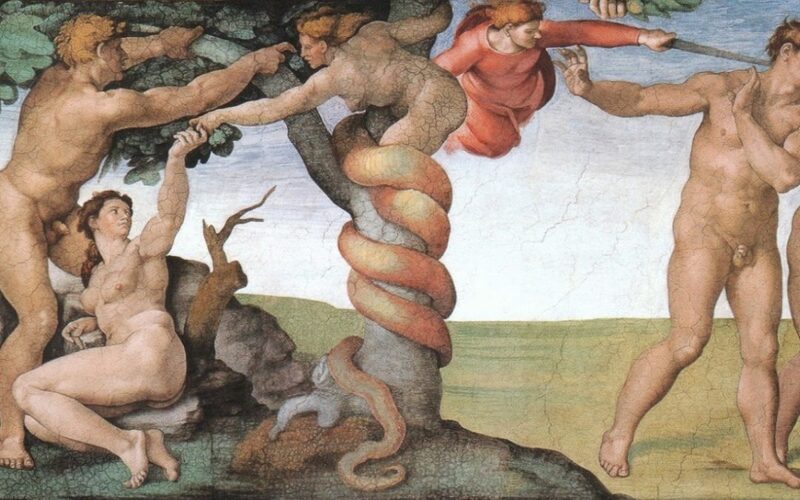 Michelangelo broke with classical tenets of the time in how he depicted the snake. The snake was traditionally represented with a small human head, usually female, whereas, here, Michelangelo turned into it a full-fledged woman-snake, whose legs stretch and wrap like a snake’s body around the Tree of Knowledge. Here, the brushstrokes become stronger and rougher, creating a dense texture for the scale of the skin. The green becomes yellow in the lighted parts and red in the shadowed parts. As the composition continues, to the right of the tree is the Expulsion from the Garden of Eden. The landscape changes abruptly, becoming barren and desolate. A stern angel threatens Adam and Eve with a sword and chases them away from the Garden of Eden. Their bodies change and they suddenly seem aged; the skin is duller, almost bruised. Their features are harsher and more drawn, especially Eve’s, who has grown ugly and hunched, with her head sinking into her shoulders and her hands in a pose expressing fear and shame. Finally, let’s have a look at Masaccio’s fresco. Actually, looking at this scene, we naturally compare it with Masaccio’s Expulsion from the Garden of Eden in the Brancacci Chapel in Florence. The gestures full of shame and the stern angel link the two works, and the difference in the masterpieces is in the intent of the artists. Masaccio stresses the emotion of the scene, the drama of the two characters, eliciting our compassion for our first forefathers; whereas Michelangelo emphasizes their physicality, the carnal side of the story, making the faces ugly but maintaining the muscular bodies typical of his art. We will talk about the Sistine Chapel again in our next post regarding another Michelangelo’s masterpiece always painted on the chapel vault, the Creation of the sun, the moon and the plants! To book skip the line tickets for the Vatican Museums and Sistine Chapel, please click HERE!